Some weeks ago I wrote a piece about a San Francisco pastor, Fred Harrell, who had recently attacked the doctrine of penal substitutionary atonement. In doing so, I made a connection between Harrell’s prior shifts – first, adopting the ordination of women and, second, endorsing homosexual relations – and his most recent movement away from the clear teaching of God’s Word. My conclusion was to posit this as evidence of a slippery slope, further noting that in our cultural moment the slippery slope is usually entered at the point of ordaining women to office in the church. Of the different reactions one that most surprised me was a denial that there is validity to the idea of slippery slopes. My initial response to this criticism is to marvel that people can take this position in light of recent church history. Still, the topic is important enough that I think it good to defend the reality of the slippery slope. Why is the slope slippery? First, let me define what I mean in referring to the slippery slope. The slippery slope simply notes that those who remove the restraint against worldly conformity place themselves in peril of further and more damaging accommodations. The slope becomes slippery when the source of friction is removed. Far from the logical fallacy of which it is charged, there is a logical basis for the slippery slope argument: when the authority of Scripture is yielded to cultural demands, the loss of that authority renders us vulnerable to further cultural demands. Herein lies the wisdom of Scripture: “If the foundations are destroyed, what can the righteous do?” (Ps. 11:3). Indeed, the very first Psalm begins with a portrayal of the slippery slope, charting a progression from “the counsel of the wicked” to “the way of sinners” and ultimately to “the seat of scoffers” (Ps. 1:1). In making these observations, I do not mean that anyone who changes his or her view in the direction of cultural preferences is irrevocably bound to further concessions. It is blessedly true that people and churches have taken a perilous step to the left (or right) and later reconsidered, and to note examples of this happening does not prove that their previous action had not been imperiled. 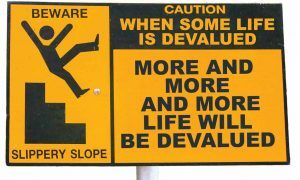 It is because the slippery slope can be escaped by recommitting to Scripture that warnings of peril are of value. Moreover, I do not mean to suggest that those who make any concessions to culture over Scripture have already abandoned the atonement of Christ. I am suggesting, however, that the slippery slope is…well, slippery. Those who remove traction from their feet may very well slide much further than they first thought possible. As Fred Harrell’s progression illustrates – together with those of the PC(USA), CRC, RCA, Church of Scotland, and other denominations – the abandonment of clear biblical teaching at one cultural pressure-point (women’s ordination), imperils us with further capitulations (homosexual acceptance), and if unchecked will find itself challenged to avoid “touching the Jesus Box” (i.e. denying even the resurrection of our Savior). Second, I noted that in our time, the slippery slope is usually entered at the point of women’s ordination. This tendency is not surprising, since the assault of secular culture against the Bible is most tenaciously focused on gender and sexuality. To uphold biblical gender norms, including the Bible’s clear teaching on male-only ordination is the single most inflammatory position that Christians may hold in our culture. For this reason, it is hard to find an example in recent history when a Christian leader or church denomination moved from biblical conservatism to unbiblical cultural conformity when the slide did not begin with the ordination of women to church office. It stands to reason, then, that we should avoid thinking that we can conform to the worldly demands regarding gender and avoid further accommodations of greater significance. This brings me to the topic of women deacons. Several critics accused me of asserting that to support the ordination of women to the office of deacon is to abandon the gospel. This response is noteworthy because I made no mention of women deacons in my original post. I will admit, however, to being unpersuaded that the move to ordain women deacons in the PCA is unrelated to a broader agenda of cultural accommodation. In saying this, I do not mean to question the sincerity of those individuals who advocate the position that women should hold the office of deacon. But I would note the growing tendency among these same persons to employ women in roles that are as associated with the office of elder. For example, in many churches pastored by ministers who are supportive of the ordination of women deacons, women are placed in the pulpit during worship services for the public reading of Scripture and to offer the congregational prayer. Women are assigned to distribute the elements of the Lord’s Supper. These are functions associated with the office of elders, not deacons. Moreover, word has recently come that pressure is being exerted in one PCA presbytery to install a woman as its stated clerk, making her a member of a court composed exclusively of ruling and teaching elders. Where is the outcry against these tendencies from those who say that they are only wishing to ordain women as deacons? Stand by the crossroads, and look and ask for the ancient paths, where the good way is; and walk in it, and find rest for your souls (Jer. 6:16). In this way alone will we navigate the perils of our times, fortifying our fidelity to Christ. Rev. Richard D. Phillips has been the Senior Minister of Second Presbyterian Church in Greenville, South Carolina (PCA) since July 2007. A version of this article first appeared on Alliance for Confessing Evangelical’s Reformation 21 blog under the title “Standing Firm on the Slippery Slope.” It has been reprinted here with permission. Is legalism and turning back to Law in NT times a slippery slope? The older I get, the more I worry we’ve just resurrected OT Law with our own NT version it cobbled together piecemeal from wherever we could dig it out of the NT. I worry we’ve completely misunderstood and let our OT law reflex make situational wisdom for a time and place into Law. You raise an important issue, and it is related to when the slippery slope is indeed a fallacy. It is fallacious to speak against doing something good and needed, just because, if we kept heading in this direction it might lead to something bad. So, for example, an anorexic man or women has made the mistake of fearing food, because they are worried about overeating. They know that one can’t overeat without eating, so, in that sense, eating is a first step towards overeating. But eating is necessary. It is good. And it should not be feared. In a similar way, it would be a mistake to let our fear of legalism lead to a neglect of the law. If Christians, particularly those of us born and raised in the Church, who have been “good kids” in our youth, and “generally been productive members of society,” don’t hear the law and understand it, we may mistakenly take comfort in our own righteousness. Like the young ruler who came to Christ and tried to justify himself (Matthew 19:16-22) overlooking the true state of our sinfulness can cause us to overlook our own desperate need for our Saviour. And then, of course, we must not neglect speaking of grace. God’s law is real but – thanks be to our heavenly Father – grace is too. 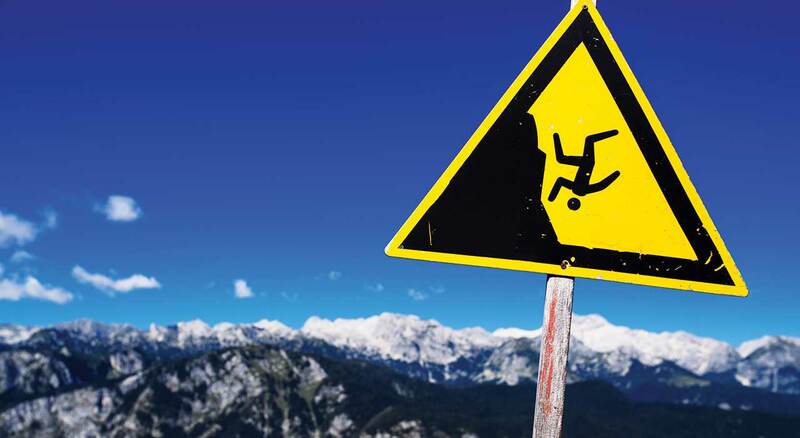 And that’s another slippery slope we could slide down – a preacher might be warned against preaching about grace so often, because of the worry that speaking of God’s grace might lead listeners to take it for granted, and to go and embrace a lawless life. But in Romans 6 Paul shows exactly why a proper understanding of grace would never lead to lawlessness – God’s people are being transformed! We are becoming more like Christ – we are learning to hate our sins, just as God does. So even as we can be free from guilt, free from worry about our sins, we aren’t going to become lawless, but in thankfulness are going to seek to embrace God and his ways all the more. So legalism and lawlessness are legitimate concerns but that there are two sides of the horse we can fall off of shouldn’t stop us from speaking of both God’s law, and His grace through Jesus Christ. Someone could preach a memorable sermon on that text.